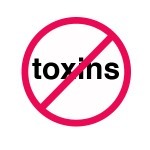 On average every one of us carries about 5-10 pounds of waste toxins in the body. YuK! These accumulated toxic wastes are in our cells, tissues and organs. These toxins like to hide anywhere they can. They like fat cells, organs (like liver and kidneys) and in the small and large intestines. They also like the mucous lining of the sinuses and lungs and in the tissues of the brain. Our bodies are designed to eliminate these toxins. All we have to do is help it by good nutrition – eating the right organic fruits and vegetables and avoiding toxins. Substances such as pesticides, chemicals, heavy metals, food additives, drug residues and the by products of metabolizing food such as fungus, yeasts and parasites accumulate in our system. If they are not eliminated these toxins in our body will be stored and over time they make us weak, sick, overweight and make our bodies inefficient at fighting infection. These toxic molecules, also known as free radicals, cause premature aging of our cells and create a whole host of health problems. This is why it is so very important for us to assist the detox process, cleanse and help to eliminate toxins in the body several times throughout the year. According to Dr. Mercola, there are 45 million different chemicals that are presently commercially available around the world. Professor Patricia Hunt of the Hassold and Hunt Lab at School of Molecular Biosciences reports that there are 12,000 new ones registered every single day. Wow! They say we are exposed to thousands of them daily. And to top it all off many of us eat flour, sugar, fast food, junk food, and in addition consume way too much food. Many of us drink alcohol, ingest chemicals such as preservatives, additives, over the counter drugs and prescription drugs. Combine that with stress, anxiety, worry, not enough rest and regular exercise and eventually we have major problems. It’s no wonder so many people are sick. It is important to avoid prescriptions and over the counter medications as much as possible. When you are prescribed medication, it is always a good to get another opinion from a naturopath, someone who specializes in natural medicine. There are so many prescriptions that are written for people that can be cured through easy natural remedies. Simple changes in diet and lifestyle can help to correct health issues and this can make a huge difference in immediate long term health well being. Unfortunately, we live in a world where everyone puts all their faith in medication and they are not aware of alternative choices. Consider this. Recently the FDA has consented to the “No Trans Fats” on food labels as long as they are less than 0.5g servings. So the manufacturers have altered the serving sizes to avert consequences. In very small amounts these seem harmless, right? Well, we do not know that what these toxins along with the poisons we are exposed to daily will create when interacted. Stay informed by reading labels and paying more attention to what you are eating. Avoid foods with preservatives. If you have a hard time pronouncing words on a label then you don’t need to eat them. Choose fresh organic locally grown fruits and vegetables. Sources of environmental toxins include unfiltered water, prescription drugs, make-up, over the counter drugs, home cleaning products, air fresheners, scented candles, additives in foods, mercury, aluminum, fungus, mold, carpet, leather, paint, new furniture, anti-bacterial soaps and cleaners, dry cleaning and upholstery cleaners. Have you checked the ingredients of your shampoos, soaps and conditioners that you use daily? Symptoms of overloaded toxins in the body include low energy and fatigue, body aches, headaches, muscle weakness, irritability, mental and emotional problems, difficulty in losing weight, acid reflux, gas, bloating, cellulite, indigestion, skin problems, arthritis, premature aging, visual problems, dizziness, anxiety and hormonal imbalances. Fibromyalgia and chronic fatigue syndrome symptoms are becoming more common in our society. Many doctors now believe it is related to overload of toxins in the body. Toxicity is at the root of many illnesses such as allergies and sensitivities, autoimmune disorders, stomach problems, yeast infections, cancer and many others. Our bodies have the amazing ability to heal itself and rid itself of toxins. Like breathing and digesting, detoxifying is one of its normal functions. But helping our bodies in the detox process can restore our bodies to proper balance. Juice fasting is a very effective way of detoxing because it enables the body to clean up and eliminate toxins instead of spending energy on digesting foods plus getting a steady supply of liquid nutrients. Benefits of detoxing include increased energy, weight loss, reduced cravings, improved digestive and immunity, reduction of cellulite, overall improvement in skin and elimination of heavy metals other toxins in the body. So take steps to eliminate toxins in your environment and in your diet, be more natural- they way are supposed to be!